Bonjour and lēe hò to our global visitors! Pacific Ridge is currently hosting 19 students from Taiwan and 11 French students from Victor Duruy High School. The experience is meant to foster global ties and expand students' horizons. Oftentimes, Pacific Ridge students will visit their guests' home-country and re-connect with their new friends while abroad. 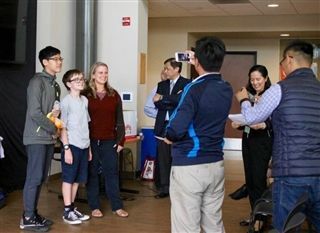 The French students will be attending classes and exploring southern California through February 17 and the Taiwanese students through February 14. Please say hello if you see them on campus.